Drazerk is helping me co-host this game. Any questions can be directed towards him or myself. If you want to post something insulting or inappropriate and know the TL mods would have a problem with it elsewhere, don't post it here. If you do, a host will warn you or modkill you and request that you be banned from future games. The hosts have the final say on what is inappropriate. If you do not like how someone is talking to you, please PM a host, Flamewheel, or GMarshal before involving the TL staff. If you are unsatisfied with how the situation is resolved, then you can appeal to the TL staff normally. The report button is a nice feature for regular TL, but not for this forum. We prefer to deal with things in house if possible to avoid confusion among the TL staff. If you have a problem with how someone is posting, talk to the host, co-host, Flamewheel, or GMarshal before using your report button. Please do not use your report button for anything other than inappropriate posts which you feel are not being dealt with adequately. 1. Voting is done in a separate thread. Please keep votes there, and only vote there. Do not PM me your vote. 7. This game uses plurality lynch. The player with the most votes at the end of the day will be lynched. This game is open to anyone. Signups will remain open until all 27 slots have been filled. This game follows] the TL Mafia Ban List. If you are modkilled, your punishment will go beyond being eliminated from this game. Please refer to it for questions about your punishment. If you want to use this game to sit out your ban, please PM Flamewheel or post in the Ban List. This game will have the hosts attempt to find replacements for the first Day/Night cycle. After that, each player is responsible for finding their own replacements, or they will be modkilled. This game will follow a 24 hour night/48 hour day cycle. In case I am not able to post around deadline, any votes after the 48 hour mark will not count and the game will be put on halt until the night post is up. Currently the deadline is 08 KST, but that is subject to change. Actions/votes will be accepted up to and including the posted time, but not after. This is a semi-open set-up. All roles will be disclosed, but exact role counts will not be revealed. Town Win Condition: You win when the Mafia are eliminated. Mafia Win Condition: You win when you outnumber the Town or nothing can stop that from happening. Sword Swallower/Fire Breather/Contortionist/Freak/Juggler/Acrobat (Vanilla Townie): You are a Role Name! You're one of the many performers at the circus, but unfortunately you possess no extra powers besides your charms, you brain, and your vote. Strongman (Veteran): You are a Strongman! You're the strongest guy around, so strong in fact, that once per game you can survive a hit. You have a twirly moustache and 300 pounds of muscle, you can't stop that so easily! You will be notified if you are hit. Lion Tamer (Vigilante): You are a Lion Tamer! After years of training fearsome beasts, you've mastered the ability to direct them to do as you please! Once per game at night, you may let your lions loose on one player and he'll become dinner. Your lions will be refunded if someone else gets to your target first. Medicine Showman (Medic): You are a Medicine Showman! You travel with the circus, selling a variety of snake oils and miracle cures. Those don't work, but the stuff you keep to yourself does. Each night you may give one player a bottle of your special medicine, protecting them from hits that night. You will be notified if you make a save. Trapeze Artist (Detective): You are a Trapeze Artist! As a performer of death-defying aerial feats, you spend a lot of time practicing for your act. This also gives you the perfect vantage point to watch the doings of your fellow performers. Each night you may observe one other player, and you will be told if they are Good or Evil. Human Cannonball (Mad Hatter): You are a Human Cannonball! While you're normally the one being shot out of the cannons, you also know a thing or two about using them! Each night you may prime a cannon, up to a maximum of two, and aim it at someone else's tent or wagon! If something should ever happen to you, your assistant will light them, blowing anyone in the way to smithereens! Changing your target counts as a Night Action and you cannot prime a cannon and change the other's target on the same night, or change both targets at once. 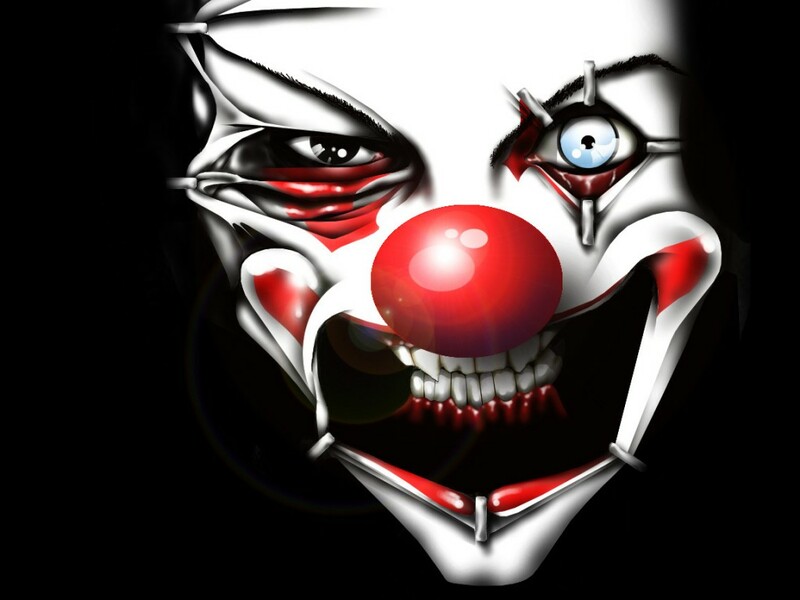 Evil Clown (Goon): You are an Evil Clown! You have no other desire than to spread fear and chaos throughout the circus, doing the bidding of you master, the Ringleader. Unfortunately, besides looking creepy, you have no extra powers to help you accomplish this besides your wits and your vote. Bearded Lady (Roleblocker): You are a Bearded Lady! You are madly in love with the Ringleader and would do anything to please him. Each night, you may use your romantic charms to stop one other player from taking an action. Your target is notified if they spend the night with you. Magician (Framer): You are a Magician! The Ringleader pays your salary, and you're in debt from buying too many props, so you're glad to keep it that way. Your experience in sleight of hand has made you an expert in being able to sneak into the tents and wagons of others to plant evidence each night, or as you see it, making it magically appear, causing them to appear Evil to any checks. Ringleader (Godfather): You are the Circus Ringleader! You're the mastermind behind the circus, pulling all the strings. Each night is a chance to accomplish a new nefarious plot, if only there weren't so many pesky people in your way. Well, at least they won't ever figure out your true intentions, since you return Good to all checks! At the beginning of the game, Mafia will be given a list of their roles, that they can distribute as they wish throughout their team. This choice must be submitted to me within 24 hours of the game starting via PM, or I will RNG the choices. All role descriptions are purely flavour, and do not imply the presence or absence of any other role. All flavour will appear exactly as it is here. This is a complete and accurate list of all possible roles in the game, although not all roles may appear in the game. I don't like spam. Please consolidate your posts and stay on the topic of the game. When you make a post, ask yourself if there's anything you'd like to add before you hit the post button, and don't treat the thread like it's IRC. Let's keep the thread readable. If I feel you are spamming, I will contact you with a warning. If you continue to spam, I will not hesitate to take action. Do not refer to activity which occurs outside of this thread or information gained by out-of-thread communication. For example, do not mention that someone has not shown up on Steam all day as a way of verifying that they are legitimately away and not just faking inactivity. I will warn you once. After that, I will modkill/replace you. If you need any clarification on either of these rules, feel free to contact me in PM or make a post about it here. Does 3 KP means 3 kills? If there are less than 3 scums, do they still get 3 kills? I noticed it says "current" KP. Does it mean it will change over time? Vig shoot scum, scum shoot vig. what happens? I am unclear what a mat hatter is. Can you confirm this? Each night you get to pick one target. You may stack up to two targets (I assume that takes 2 nights). You can also change your target, which is counted as 1 action. In short, every night, you can do one of the following, aim your cannon at one target or switch target. If you got night killed or lynched, your targets will die. Can you also choose to disarm your cannon? (aim at no one) Does that count as one night action? KP stands for Kill Power and it's the amount of hits mafia can make per night. The equation for Mafia KP is #Mafia Alive divided by 2 rounded up. So, with 6 mafia to start, that's 6/2 = 3. Once there's 4 Mafia, the KP will drop to 2, and when there's only 2 left it will drop to 1. If vig and scum both shoot, they should both die. All actions resolve simultaneously except for specific situations, such as mafia and a vig stacking their hits in which case the vig is refunded his shot, or roleblockers/framers, which always act first. A mad hatter is a role which places bombs on his targets, and when he is killed at night, those bombs explode. Note that they do not go off if he is lynched. In this game, each night the Hatter can place one bomb, or change the target of one of the bombs that have already been placed. He can't do both at once in this game. He can have a total of two bombs placed at once. Note that placing a bomb or changing the target counts as a night action, which means it can be roleblocked. Once the bombs are placed, they cannot be removed, only changed from who they're put on. Roleblocks do not block passive abilities. Passive abilities include Veteran's extra lives and the explosion of Mad Hatter bombs when they are killed. No roles are compulsory. Any role can choose not to act on any night. If the hosts do not receive a PM with a night action, it will be assumed that you have chosen to abstain from taking a night action. Everything that appears in Day/Night posts is flavour. If a Ringmaster is mentioned in the opening post, it does not imply that one is in play. If someone is eaten by lions, it does not imply that they were killed by a vigilante, etc. This is not a clue game! You successfully shot X last night. You successfully protected X last night. You successfully protected X last night. He was shot. You were hit last night. You successfully placed a bomb on X last night. You successfully changed your bomb from X to Y last night. You successfully roleblocked X last night. You successfully framed X last night. You were roleblocked last night. All PMs sent at night will appear exactly, or near exactly, how they are here. Do not try to use any PM you receive from a host as a way to confirm roles or catch mafia. If you ask a question of the hosts in PM, and wish to mention the answer in the thread, ask the question again in the thread. Don't claim host knowledge without the hosts explicitly stating it. Mafia will not receive confirmation PMs for their hits. It is assumed that all hits are successful. Mafia may send in all their actions, including hits, together, or each role may send in their own action for Framers and Roleblockers. Hits can be sent in by any member of the mafia. Only the last actions received will be counted. In the case of an individual sending in an action and a list of actions being sent, the action sent in by the individual will be counted unless he explicitly changes it or allows for others to change his action for him. Actions must be sent by PM to the hosts. Actions written in the Mafia QT will not be counted. Remember to send a PM to both hosts detailing your Night Actions. In the case that one of the hosts are not around, the other host will act based on the PMs that he has received. Any missing actions will not be retroactively applied. Please send any information about activity, being absent, or needing replacement to both the hosts. Do you get your bombs back if the person they are on dies? From the flavor text it would seem so but since it is flavor I wanted to clarify. You can just place new ones onto a maximum of two people at once. Is there going to be a mayoral election? 3. Mattchew Medic killed Night 3. 7. Foxtrotter Vanilla Townie lynched Day 1. 8. KtheZ/Marvellosity Vigilante killed Night 1. 10. austinmcc Vanilla Townie killed Night 2. 12. Rastaban Vanilla Townie killed Night 1. 14. NosmurfHere Vanilla Townie killed Night 3. 18. s0Lstice Vanilla Townie killed Night 1. 19. mKmKmK Vanilla Townie modkilled. 22. Bill Murray Godfather killed Night 1. 23. drwiggl3s Vanilla Townie killed Night 1. 24. Katina Roleblocker lynched Day 3. 25. EchelonTee Vanilla Townie lynched Day 2. Role-list updated. Player-list updated. Cheers. Your lions will be refunded if someone else gets to your target first.